The grapes for the Napa Valley Cabernet Sauvignon were sourced from our organic and biodynamic vineyards in Rutherford, as well as select vineyards in Calistoga and Coombsville. Our estate vineyards are located on gravelly alluvial fan soils with good drainage, necessary for growing excellent quality Cabernet Sauvignon. The vineyards are diligently monitored throughout the growing season to balance the crop size and quality. 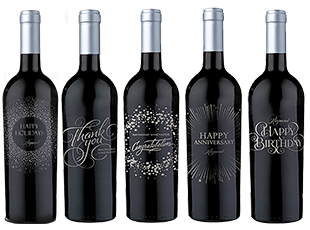 Or you can create your own personalized etched bottle. Contact your Ambassador or Customer Care to order! Please allow 3-4 weeks for delivery. Aromas of raspberry and blackberry. Flavors of vanilla, boysenberry, cardamom and anis are complemented by a long finish. The unseasonably warm temperatures in the early growing season in the Napa Valley in 2015 resulted in early bud break and bloom. Colder temperatures later in the season caused uneven fruit set and resulted in a smaller crop than previous average yields. Winemakers and vineyard crews worked diligently to pick and sort the best berries. Harvest began as early as July 22nd, one of the earliest harvests recorded and concluded by mid-October. While drought was still a concern for most of California, Napa Valley received 75% of normal rainfall for the water year.